Ok, here is one for the boys, a wallet that is cool and it must be said, a rather useful gadget! Don’t you hate it when you are waiting for a bus and the Oyster scanner makes the dreaded “you’ve got no money it this” noise and off you plod very red-faced. Well, no more! David Bruno & Tom Seymour, a London based creative team, have come up with a solution. Introducing the Oyster Card Wallet! 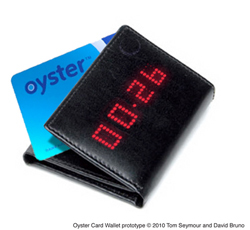 The wallet is fitted with an Oyster reading device that lights up to show you the amount of money on your card…genius! No more embarrassing incidents at the gates, with you holding everyone up. The duo have been in talks with TfL and want to go back with a petition of support to make this idea happen. So if you like it, and want one one day, please help their cause by clicking ‘like’ on this link. Let’s get this campaign on the road and maybe they’ll make some girly ones too! This entry was posted in Accessories, fashion, gadgets, technology, Uncategorized and tagged David Bruno & Tom Seymour, London, Oyster Card Wallet, wallet. Bookmark the permalink.